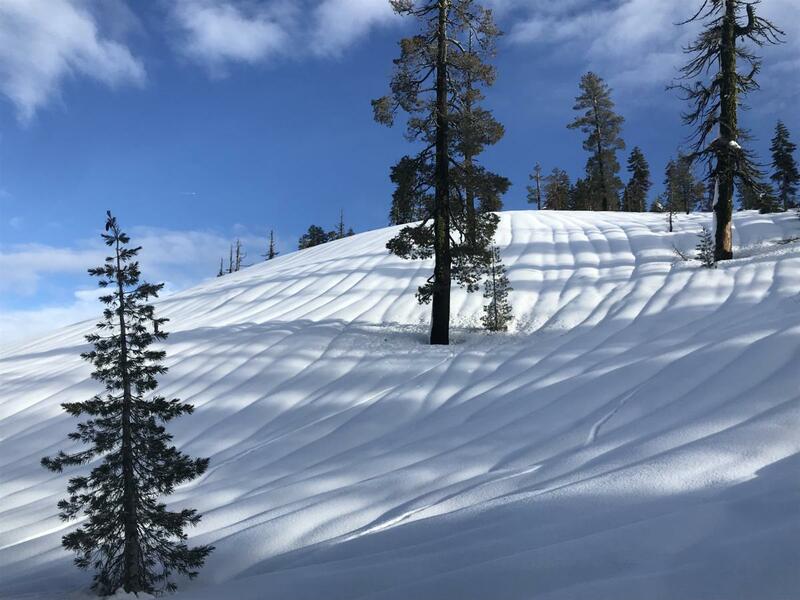 Lake level area hosts semi-soft and saturated snow. Castle Lake itself is still frozen over, but with 6-8 inches of slush on top of hard ice. Despite mushy conditions on the lake, it is still supportable with skis on. Walking on the lake would result in wet feet. Rain runnels dominate the Castle Lake area. Two feet of consolidated snow rests on top of old snow surfaces. Breakable crust of all forms dominates and is widespread. Icy and sometimes breakable crust will be found on wind exposed ridgelines. Some loose-wet debris was observed below the steep, northerly facing slopes behind the lake. Old glide cracks were observed on Middle Peak. Clouds and fog quickly enveloped the area and a foggy descent ensued. Winds were steady and moderate for a short period this afternoon out of the southwest. Wind duration is unknown, however minor wind loading had occurred on easterly aspects. Some cracking was observed while skinning along a ridgeline. Fresh wind slabs were very small and inconsequential. Snow level was ~500 vertical feet below lake level.